Another campsite that I have been meaning to write a review for but never quite got around to it was Rocky Neck State Park located in East Lyme, Connecticut. There are about 150 campsites spread out over 5 loops, with most of them having room for trailers and RVs. There are also two smaller tent only sections that have pit toilets, but the 5 main loops all have running water and bathrooms with showers in them. There are no hook ups in this campsite for water and electricity, so if you are bringing an RV or a trailer make sure to keep that in mind. When we visited Rocky Neck State Park, we stayed in the Osprey Loop because it was more shaded than some of the other loops which was important to us in the Summer. The Seagull loop also has good shade, but some of the sites are more open and only partial shade. The Heron, Crane, and Egret loops are much more open and some of the sites are basically in an open field, you will be receiving direct sunlight all day! We tend to stay asleep longer than most when camping, so it’s nice to have the added shade to sleep a little longer. The campsites here are relatively close, but the ones in our area were not right on top of each other and they were quite large in size. There was plenty of little trees, bushes, rocks in between the campsites so that you didn’t have to constantly stare at each other. You are able to see your neighbors directly across from you though, but that becomes less of a problem at night. Each campsite comes with a fire pit and a picnic table too. The bathrooms and the showers here are definitely acceptable, and they were clean the whole time we stayed here. If you do have a campsite near the bathroom just be warned the outdoor lights will be on all night (just like most campgrounds, though). The one thing that was funny when we did visit was that there were quite a few skunks wandering through our campsite area! They ended up being harmless even though they were quite bold, walking right by us. We did not get sprayed and nobody in our area did, and they started to become pretty cute as they clumsily wandered along. I’m not sure if this was unique to the Osprey loop or if things have changed (it was over a year ago when we camped here), but it might be something worth asking a Ranger about. As long as you don’t startle or attack them, they weren’t really a bother to us. They stayed far away from the campfire and shining a flashlight near them was a good deterrent as well. 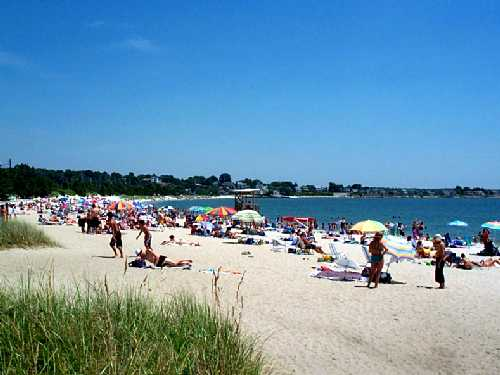 The beach here is really nice in my opinion, right on the Long Island Sound. It’s a pretty large beach but it does get very crowded on the weekends in the Summer. You can walk right down a path/road through the campground area to get to the beach in about 5 minutes, but there is also a large parking lot for beach visitors only. This is what causes the beach to get so crowded on weekends because of people making day trips just to enjoy the beach. Because of the beach being on the sound, don’t expect much wave action as you would on the ocean if that’s what you are into (I know I am! ), but it’s still pretty nice. The water is relatively clear and you can go quite a ways out as it stays shallow for a while. There is also an Amtrak train that goes right above the beach that will probably scare you a few times before you get used to the noise, and you might even hear it off in the distance at night depending on what camping loop you are staying at. This is a nice State Park if you are looking for a weekend or long weekend getaway at the beach and definitely a good place if you have kids. There were lots of families here when we went, and the calm water and the beach makes it a perfect place to go. If you are looking to completely get away to a secluded area, this is not the type of campground you want to visit. But getting away in the outdoors for a few days while car camping and being able to go to the beach everyday for only $30 a night ($20 for CT residents) is not a bad deal at all. There are a few hiking trails through the woods/marsh area and there is also plenty of fishing spots. We enjoyed our stay at Rocky Neck State Park, and while it was nothing earth shattering I can definitely recommend staying at this park. If you think I missed anything, or had any additional questions about this park feel free to send me an e-mail using my contact form with your questions or comments, or just leave it right down below in the comments section! Yeah it’s a great state park if you like to swim, and the water is really nice here even though it gets pretty crowded. For $30 a night, this might even be leaning on the expensive side of tent camping – but it’s still a great deal I agree! Great review!! I am always looking for info on where to find the best/shadiest campsites!! Glad that you were able to find some valuable information – I also do the same. Keeps you cooler and the sun doesn’t come blazing in your tent in the morning as well.